One of the things I don’t have in my house is a mantelpiece. It’s a comparatively new house, which was one of the things I loved about it when I moved in. But I do miss a fireplace and a mantelpiece. When I think of a mantelpiece I always think of my grandmother and her lovely home in Blaker Street, Brighton. My cousin recently sent me a couple of photographs of the interior of this house, taken on Christmas Eve 1959 and it got me thinking again about what was kept on this shelf above the fireplace. 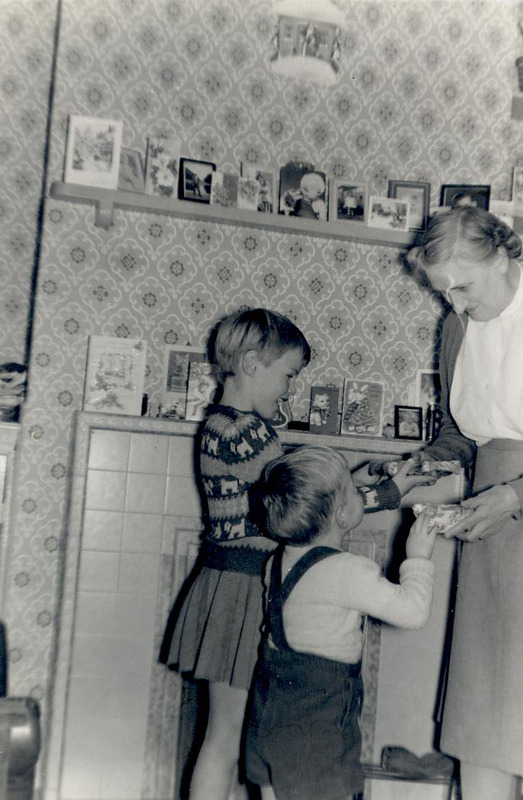 My cousin Sue and her brother Ian with our grandmother Annie Dinnis (Cleeve). 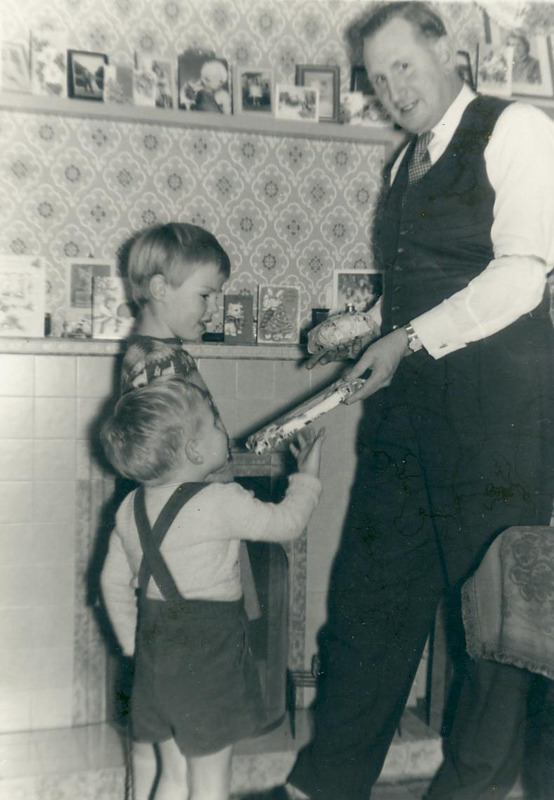 Sue and Ian with our Uncle Jack on the 24th December 1959. 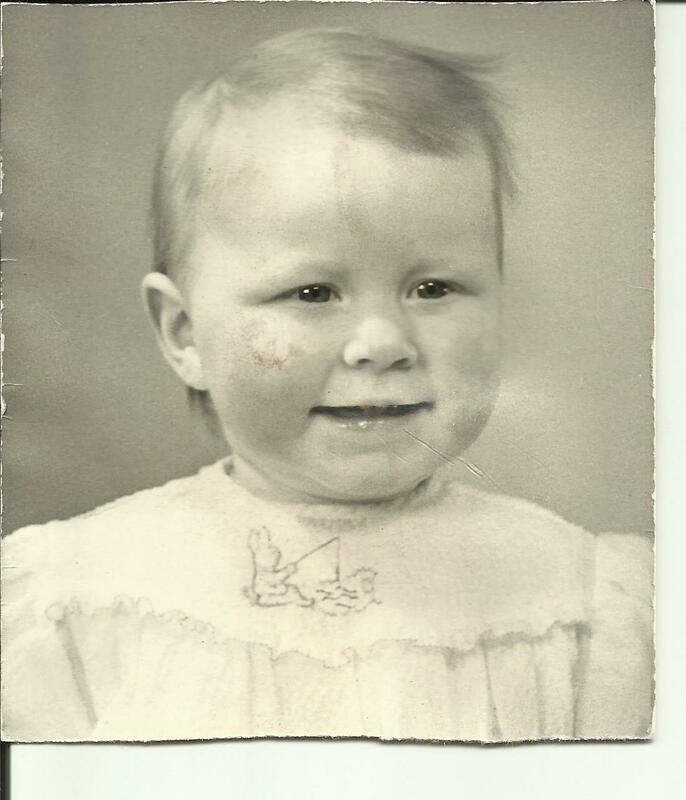 There are more photographs of me that my grandmother kept, mainly school photographs taken at different ages. It is truly lovely to hold these photos and to know Nannie also held them. I remember sitting in this room and thinking one day I would also keep family photographs on shelves in my own home. This entry was posted in Annie Cleeve, CLEEVE, Jack Douglas Dinnis and tagged Blaker Street, Brighton, cousin, family photographs, Ian Arkell, mantelpiece, School photographs, Susan Arkell. Bookmark the permalink. 1 Response to What’s on the Mantelpiece? Thank goodness for photography! So many photos and boxes to cipher through but the one thing were not lacking is photos. Spent a few hours on the phone with my Uncle Don for his 79th bday feb23 (mom’s half brother) and I was surprised how much he remembered as I shared details of info in Ancestry. It got me spinning into a Vortex as Heather calls it! We have so much unanswered history to find but the photos tell a story and Im anxious to learn. I have a Mantle but the big projection screen comes down and prevents me from putting photos on it. The visual I had was putting photos in my long hallway but my mother in laws paintings are on it! ha Limited wall space because of so many french doors and windows of the waterview.